What is Von Willebrand disease? You might have heard the term but not know what it is or how it affects dogs. Von Willebrand disease is a hereditary bleeding disorder that is characterized by a deficiency of von Willebrand factor, a specific protein needed to help clot blood. Sometimes called pseudohemophilia, vWD is the most common inherited bleeding disorder in dogs and humans. In a normal dog, the blood clots (coagulation) and blood flow stops (hemostasis) in response to trauma to blood vessels. While it may seem like a basic function, blood clotting is actually a very complicated process. When coagulation begins, blood cells called platelets clump together. The platelet clumps then adhere to the cells along the walls of the blood vessels to form a clot (basically "plugging" the hole in the vessel). Substances in the blood plasma called clotting factors facilitate the process of coagulation and hemostasis. One set of these substances are glycoproteins called von Willebrand factor (named after Dr. Erik von Willebrand who discovered the substance due to his own disorder). During clotting, von Willebrand factor is essential to bond platelets to the cell wall by creating fibrin, a kind of cellular mesh that seals the blood vessel. In addition, von Willebrand factor works with clotting factor VIII to form fibrin. When a dog does not have a sufficient amount of von Willebrand factor, the blood cannot clot properly. This can lead to prolonged and sometimes uncontrollable bleeding when a blood vessel is broken. Bleeding can be caused by an unexpected injury or even a surgery. In some cases, bleeding occurs spontaneously from the GI tract, urinary tract, gums, and/or nasal cavity. Dogs may go for years before showing signs of vWD. Minor cuts and scrapes may not bleed excessively. Often, symptoms appear during the first surgery (often a spay or neuter). In mild cases of vWD, bleeding issues do not appear until later in life after the disease is worsened by other disorders, such as hyperthyroidism. In more severe cases, bleeding may occur in puppies while they are teething. There are three identified types of von Willebrand disease in dogs. Each involves a varying degree of deficiency of von Willebrand factor. TYPE 1: Dogs with Type 1 von Willebrand disease have all the proteins that makeup von Willebrand's factor, but they lack a sufficient amount to facilitate effective clotting. Type I is the most common form of von Willebrand disease. This form is most often seen in Doberman Pinschers, German Shepherd Dogs, Standard Poodles, and Shetland Sheepdogs. However, type 2 vWD may be present in other breeds or mixed-breed dogs. Many dogs with type 2 vWD show no symptoms until they undergo surgery or experience a trauma. TYPE 2: Dogs with type 2 vWD have a normal level of von Willebrand factor, but the proteins are structurally or functionally defective. Type 2 is typically seen in German Wire-Haired and Short-Haired Pointers. Dogs with type 2 vWD can experience severe bleeding episodes, sometimes with no known cause??? TYPE 3: Dogs with type 3 vWD are completely missing vWF. This form is most often seen in Shetland Sheepdogs, Scottish Terriers, and Chesapeake Bay Retrievers. Type 3 is the most severe form of vWD. There are several bleeding disorders in dogs, so a bleeding episode alone is not enough to diagnose vWD. If your dog has had an episode of excessive bleeding, then testing should be done as soon as your dog is stabilized to determine the cause of the bleeding. First, a complete blood count should be done to look and all blood cells and determine if they are normal. Dogs with vWD often have normal CBCs unless they have been bleeding. A clotting time test called buccal mucosal bleeding time is a quick and sometimes useful tool in diagnosing bleeding disorders. The BMBT test involves making a small prick in a dog's gum and timing how long it takes to form a visible clot. This may be done while a dog is under anesthesia prior to surgery. BMBT is not always prolonged in dogs with vWD, so this is not a definitive test for vWD. Other tests to determine bleeding time include activated clotting time and PT/PTT. These will have normal results in dogs with vWD. However, it is important to run these test to rule out other bleeding issues. The primary way to determine the presence of vWD is to run a von Willebrand factor antigen assay, or vWF:Ag%. These levels may fluctuate throughout the day, so there are a few ranges to consider. Normal dogs will have a result of 70 to 180. A dog is considered borderline at a result of 50 to 69. Abnormal results range from 0 to 49. DNA testing is another way to determine if a dog will be affected by or is a carrier of vWD. This test is only available for certain dog breeds and can be performed by a lab such as VetGen. If the dog with vWD is actively bleeding, steps must be taken to try and control blood loss. If the bleeding is minor to moderate, it may be possible to stop bleeding with bandages or other means of pressure. When bleeding occurs during surgery, the vet will attempt to ligate vessels (sew up) blood vessels as fast as possible. A dog with significant blood loss will need a blood transfusion. Vets also take precautions to avoid any drugs that can further prolong bleeding or affect clotting mechanisms. If the presence of vWD is known prior to surgery (and the surgery is necessary) is it possible to administer cryoprecipitate, a blood product that is rich in von Willebrand factor. If cryoprecipitate is not available, plasma is an alternative (though it does not contain as much von Willebrand factor. These blood products can temporarily provide the dog with the vWF needed to form blood clots during surgery. For dogs with mild vWD (particularly Type 1), vets may administer a hormone called desmopressin acetate, or DDAVP. This releases vWF into the bloodstream and temporarily shortens the bleeding time. Not all dogs will respond to DDAVP. Many vets consider this treatment controversial or ineffective. The best thing that can be done to protect dogs from von Willebrand disease is to prevent them from being born with it in the first place. It is important for the breeders of dogs at risk to screen their dogs prior to breeding. A dog with abnormal results should never be bred. Any dog with a hereditary health problem should be spayed or neutered in order to protect future generations of dogs. Fortunately, dogs with mild to moderate vWD can often live normal lives. Knowing your dog has the disease prior to surgery is the best way to protect against bleeding episodes. Dogs with severe vWD should be monitored to prevent injuries and to detect spontaneous bleeding as soon as possible. These dogs may need to undergo blood transfusions periodically to treat blood loss. 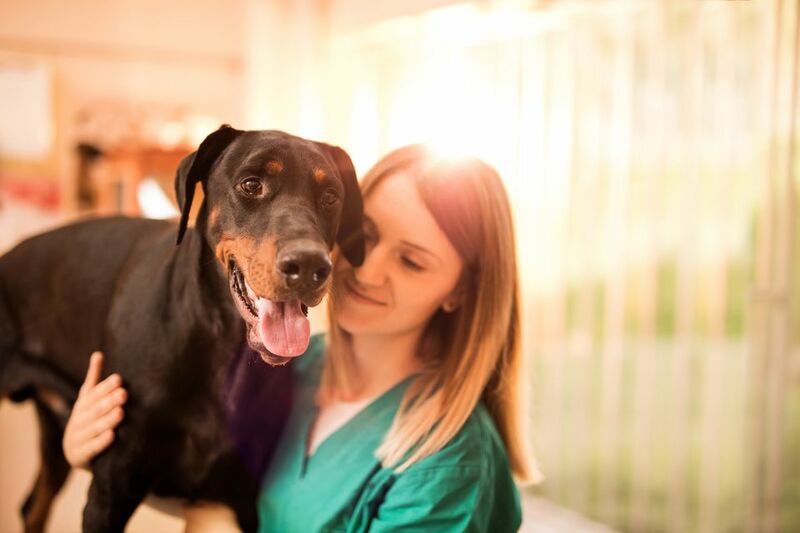 If your dog has von Willebrand disease, be sure to find a veterinarian you trust and stay in communication about your dog's needs and ongoing condition. It's also important to have a list of nearby emergency hospitals available in case a bleeding episode occurs. It's essential that you bring your bleeding dog with vWD to the nearest open vet as soon as possible. Also, remember to communicate with any new vets or vet staff about your dog's vWD status. This will eneable them to keep your dog safe and avoid treatments or procedured that can cause harm. What Does It Mean if Your Dog Has Von Willebrand Disease? What Type of Heart Defect Is a PDA?